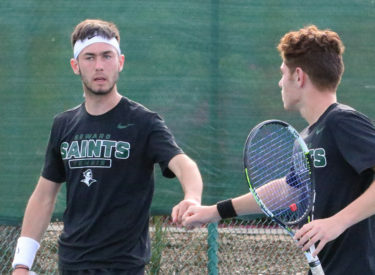 WINFIELD, Kan. – The dominance of Seward County tennis continues into the 2018 fall season, as the Saints came away with the singles and doubles title in the ITA Regionals over the weekend. Seward was guaranteed the trophy in both finals matches as the Saints were pitted against each other for the titles. The Saints sent eight players to the court in the single bracket, single elimination tournament. The Saints send all but two players to the quarterfinals as Gabriel Nery lost to Cowley’s Bruno Suiama 6-3, 6-3 and Jafer Infante lost to Cowley’s Angelo Yasuro Ito Tost 6-4, 6-1. In the quarterfinals, two matchups saw the Saints pitted against each other, with Nicolas Rousset defeating Alex Mesquida 6-0, 6-1 and Hugo Lobo defeating Carlo Izurieta 6-3, 6-4. The other two matches included two upsets as Sander Jans took down the No. 4 seeded Suiama 6-2, 7-6(4) and Francisco Vargas upset the No. 2 seeded Tost 6-2, 3-6, 6-1. With the four remaining players all Seward County athletes, it came down to intrasquad competition. Rousset defeated Jans 6-3, 6-1 to advance to the finals, while Lobo defeated Vargas in a hard fought 4-6, 6-4, 6-0 match. In the finals Rousset battled back from a first set loss to win the ITA Regional 2-6, 6-1, 6-4. It marks the second straight ITA Regional Title for Rousset. In the doubles draw, three out of the four Saints teams advanced to the semi-finals, with the team of Infante and Mesquida getting upended by Cowley’s team of Casey Edwards and Valter Oshiro in quarterfinals 6-4, 6-0. Lobo and Rousset got revenge for their teammates, defeating Edwards and Oshiro 6-1, 7-6(6) to advance to the finals to take on the Seward team of Jans and Nery, who defeated Vargas and Izurieta 6-1, 7-6(4). In the finals match, Lobo and Rousset came away on top with a 4-6, 7-6(1), Retire victory. With the ITA Championships completed, Rousset and Lobo will travel to Rome, Georgia to compete at the ITA Cup on October 11.